Divine curves and a signature flange detail in beautiful linen – what more could you want? 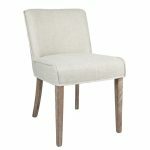 The Lennox dining chair brings relaxed natural fabrics and fine design together to create the ultimate chair for your dining table. Available in Natural Linen, Indigo Blue and Hamptons Blue.